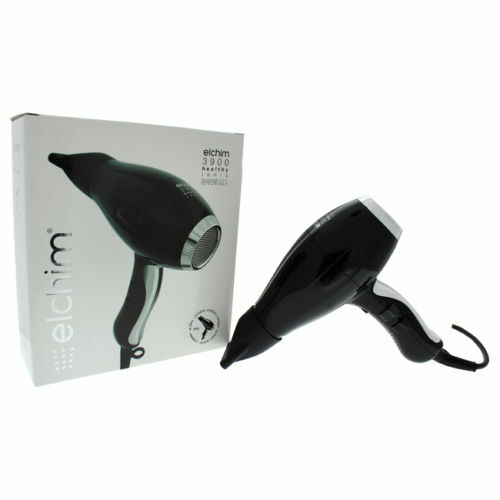 Elchim 3900 Healthy Ionic Ceramic Hair Dryer Black / Silver. The Elchim 3900 Healty Ionic Dryer nourishes the hair, making it shinier and more hydrated, and is ideal for all hair types giving you hairstyles that last longer. One of the most powerful dryers, the Elchim 3900 reduces drying time by more than 30 and closes hair cuticles. Designed with professional stylists in mind, innovative ergonomics distribute weight over the forearm, avoiding carpal tunnel syndrome and strain to the wrist. The built-in silencer reduces noise pollution in your home or salon, and low electromagnetic emissions are an ally to your health. Notify me when "Elchim 3900 Healthy Ionic Ceramic Hair Dryer" is re-stocked.